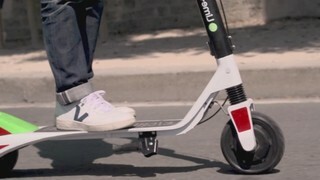 NEW BRAUNFELS (KXAN) — On Thursday, the city of New Braunfels announced a temporary ban on shared services using motor-assisted scooters and electric bicycles. The new ordinance cites the interest of public safety of motorists and pedestrians as the reason for the ban, which also includes any bicycle equipped with GPS. The city reiterated that the operation of any personal transportation device used through a shared mobility service was not allowed within the city limits. Penalities will include a fine of up to $500. The ban will continue for 90 days or until the council moves to allow the scooters and bikes back into the city. WILLIAMSON COUNTY, Texas (KXAN) — Highway 183 is reopened after a crash at State Highway 138 shut it down in both directions on Saturday. The Williamson County Sheriff's Office tweeted about the crash north of Liberty Hill around 6:30 p.m.
AUSTIN (KXAN) — Youn can't travel across Texas without seeing a billboard plastered with a smiling beaver at some point in your journey. Buc-ees has become synonymous with Texas road trips, and one super fan has made it his mission to visit all these giant rest stops in the lone star state. Cody Esser, also known on his travel blog as Impulsive Traveler Guy , detailed his love for the pit stop chain and laid out his plan to see them all.